Statistics show that a solar thermal system can cut water heating expenses by as much as 80%. Renewable energy sources are increasingly popular for home heating needs, and solar energy is the most common choice for homeowners. While it's difficult to heat an entire home with solar, it can be used as a supplemental energy source that reduces your home's energy costs. Precision Air can install or service a solar thermal system to ensure maximum efficiency. Our experts will evaluate your home's energy needs and recommend the best solution for you. 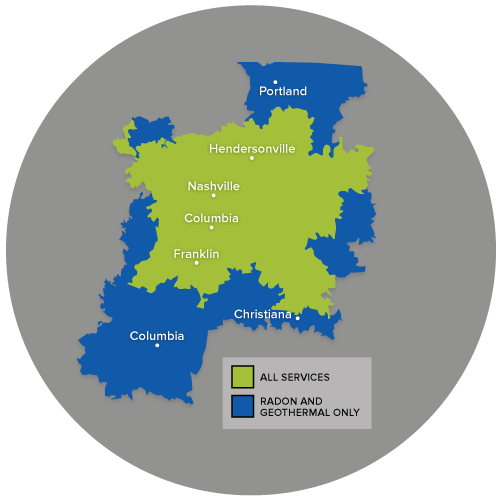 Call us today at 1-844-386-0719 or click below to get started with a free quote in Nashville, Franklin, Murfreesboro and the nearby areas! The basic anatomy of a typical solar thermal system isn't difficult to understand. The sun heats an anti-freeze solution in a solar collector. When the liquid in the collector reaches a preset temperature, it is pumped down to a heat exchanger located inside a hot water tank. If the water stored in the tank isn't sufficiently warmed by the heat exchanger, an auxiliary heater (electric or gas) can make up the difference until the water is hot enough to use. On a sunny day, no auxiliary heat may be necessary. At other times, electricity or gas may have to provide all the energy to heat the water. A solar thermal system can be sized and designed to only heat water used for washing, or to provide hot water as part of a hydronic heating system. The terms solar heating and solar thermal heating are sometimes used interchangeably. It's more accurate to say that solar thermal is one type of solar heating system. A solar thermal system uses the solar energy to heat water that can be used for heating, washing or both. The simplest way to use the solar energy to reduce heating costs is to apply passive solar heating concepts. These include having a generous number of south-facing windows to admit winter sunlight into the living space, and utilizing thermal mass to store and radiate solar heat. A dark tile or masonry floor does a good job of absorbing and storing solar heat. Providing that the house is well insulated, a high-mass floor can remain warm for hours after the sun goes down with this home heating system. Obviously, incorporating passive solar heating features into a house is much easier to do when a new house is being designed. However, if your house has good southern exposure on one side, you could consider taking advantage of this solar exposure by installing new insulated windows and perhaps a tile floor that can be warmed by the sun. If you're interested in improving your home's energy efficiency and reducing utility costs, the local experts at Precision Air can help. We provide quality solutions for solar and a variety of other heating systems. Call us today at 1-844-386-0719 or contact us online to get a free estimate in Nashville, Franklin, Murfreesboro, Antioch, Hendersonville, Brentwood, Smyrna, Lascassas, Madison, Hermitage and the nearby areas.